Annual verbena will not survive frosts. Mix a standard application of a balanced organic fertiliser into the soil prior to planting. In midsummer, drench plants with a liquid fertiliser to prolong bloom time. When growing verbena in containers, feed with a liquid fertiliser every two weeks. Verbena’s low, spreading growth habit make it a good flower to grow in front of taller flowers, or as a trailing plant in mixed containers. Sow verbena seeds indoors to get a head start, and set them out after your last spring frost has passed. Bedding plants are widely available at garden centers in spring, and some improved cultivars are grown from rooted cuttings, and can only be started from purchased plants. Annual verbena may decline quickly when summer weather turns hot and humid. 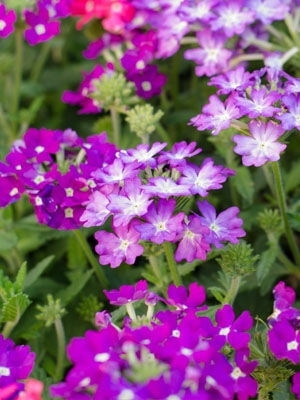 In warmer areas, perennial verbenas may grow better than the annual form. Flower colours include blue, violet, purple, rose, dark red, yellow, salmon, white and many bicolours. Clip off old blossom clusters weekly to help plants develop more bud-bearing branches. Spider mites cause leaves to look bleached and pale. Dispose of infected plants, because they cannot be brought back to robust health.